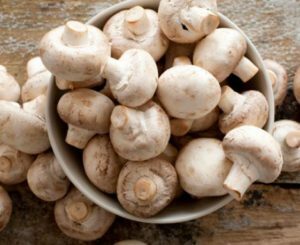 A la Carte: Mushrooms by the Million? Sounds Like Soup! You are here: Home / Columnists / Nibbles / A la Carte: Mushrooms by the Million? Sounds Like Soup! I am such a spoiled princess, even if I don’t have anyone around to spoil me. Once I feel if a snap of coolness, I begin to think about what to cook for the next two seasons. In the late spring, summer and early fall, I buy a lot of fresh produce at farm markets let those ingredients speak for themselves, eating them raw, like tomatoes, sweet peppers and salads with a whisper of dressing, or simply grilled with a little olive oil and fresh herbs. Anyway, I made two batches of mushroom soup. I had a couple of recipes in my head, but decided that it is time to play around with soup. So this recipe is all mine. And I must say, it is better than any other mushroom soup I’d ever made. Once again, a few steps are important—saute the mushrooms and onions, add cream sherry twice (I have Harvey’s Bristol Cream Sherry, but I also have a bottle of Sheffield Cream Sherry of California at a fraction of Harvey’s) If you want to add more onions or more mushrooms, be my guest. Maybe 1 percent milk would work. In a large heavy-bottomed pot (I use a Le Creuset Dutch oven), melt butter on medium heat and add mushrooms. Stir periodically until mushrooms take up all the butter, then add onions. Continue stirring until onions are light blonde in color. Pour 2 tablespoons sherry into the pan and cook until almost dry. Toss flour over mushrooms and onions and stir until veggies are coated. Add milk, stir, then turn heat to medium low. Add the rest of the sherry. Cook for about 10 minutes, stirring periodically. Add all the chicken or vegetable stock, stirring, and add salt and pepper to taste. Simmer for another 10 minutes or so and taste again for salt and pepper. I wait until the soup is cool, then puree it just a little in my big Ninja of use an immersion blender. Or do neither. Soup can be served immediately or refrigerate and reheat over gentle heat. If soup is too thick, add more stock or water.